As a CIO/IT leader, you are putting your job on the line with IT managed services because you essentially transfer some responsibility outside your organization, even though you are ultimately responsible for providing that service level at that high degree. Therefore, you cannot pick a managed services provider purely based on price. When you give a piece of your business to someone else, you need a high degree of trust. You also need collaboration between the parties to make sure that you are receiving the services that you expect and deserve. In collaborating on a long-term plan, you want a partner that will flex with you, that will understand your business, that will be out in front of you and will help you watch around corners as your business changes. Shopping for the lowest price is tempting because some IT managed services have become commoditized. But you should look for MSPs that “understand your business and that speak less about the technology,” suggests a CIO article on getting the most from your IT managed services provider. "I think that's important across the board,” Carolyn April, senior director of industry analysis at CompTIA. “You want a partner that can talk about business outcomes and how their services are going to help further your goals from a business perspective, not a technology perspective." 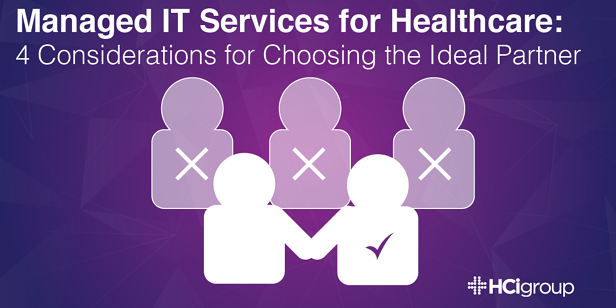 The ideal healthcare IT managed services partner will customize a contract according to your organization’s needs, rather than providing you with a generic SLA. Your partner should be able to provide multiple services without compromising quality. Just because they say they can do everything does not mean they have the capability or capacity. Although you may want a partner who can come in and provide solutions to each of your needs, it makes sense to start small and allow them to earn each additional piece of business. Start with a smaller piece of managed services, like a help desk. If they do well with the help desk, you can give them the opportunity to support your desktop roll-outs, infrastructure management and/or data center. Look for a partner that is good in all these areas. Avoid firms that are new to managed services. Vet out that they have the capacity, the team and the experience that you need. For example, if you want a firm to manage your mainframe, ensure that they have experience handling the associated applications as well. Otherwise, they may manage the mainframe well but struggle with the applications. If the firm doesn’t know healthcare, they may not understand your hours of operation or how their services impact your overall organization. Your chosen IT managed services provider must understand hospital operations and how IT impacts patient care. Your healthcare organization’s needs can change quickly. Your managed services partner should be able to keep up. If you are refreshing hardware, you should be able to pick up the phone and request more technicians. Your managed IT services provider should be able to properly handle the on-boarding and training of resources. They also should be able to spin down the resources after your need has been met. Similarly, you may consider outsourcing break/fix to a firm that excels in that service. Confirm that they can scale their resources up and down as needed if you do. IT managed services can help your organization reduce costs, increase efficiencies and improve care. But choosing the ideal managed services partner is essential. Maximize your ROI by considering the right factors. Contact The HCI Group if you would like to learn more about how IT Managed Services could help your healthcare organization.